The graph above shows the latest available data for Iraqi production. As you can see, there was a sharp increase in March and April. The April number is entirely dependent on one source - OPEC (secondary sources) - but post-invasion Iraq seems much more transparent than other middle eastern countries and the data sources don't vary that much. So I would expect this to be mostly confirmed. The country is targeting production of 3.4 million a day this year and more than 4 million barrels in 2013, according to Asim Jihad, a spokesman for the Oil Ministry in Baghdad. Iraq, seeking to more than double oil output by 2015, is poised to overtake Iran as OPEC’s second- largest producer by the end of the year as sanctions hobble crude production in its Persian Gulf neighbor. 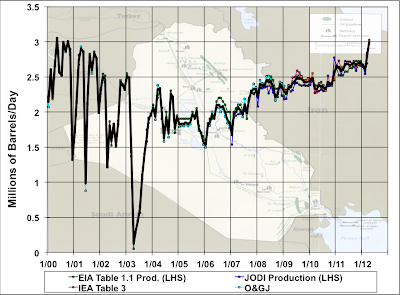 My past coverage on prospects for Iraqi oil production can be found here. Iraq, freed from a totalitarian dictator by the US miltiary, now grows its economy. As the economy grows expect sectarian violence to drop. I followed your Iraq posts with great interest. This was a great call.